March is the month to commemorate International Women’s Day. To be exact, it is March 8 of every year. What does it mean and why I decided to write this letter? I am writing this letter to let me know that I have not forgotten myself especially on this month of commemoration for women. At this young age, I’ve been through convenient and difficult times of life that I never imagined before. So, this letter is for me because I reckon I deserve to be acknowledged on this day. Aside from that, I write this with a hope to raise awareness and encourage other people like you, the one reading this, to construct something about yourself and for yourself because if it is not you, who else would do that? Lastly, I write this so that I can have something to read, smile or even frown when I am older than 23. Especially that few sleep from now, that numeral figure will be a whole lot different even number soon. Hey, you! Ugh, I can’t believe you are twenty-three years old by now. It seems you are just seventeen years old this morning. How are you doing? I notice you have a very hectic schedule lately. Please don’t forget to pause and have a little break every once in a while. I write this letter because I have a weekly blog assignment to do, hahaha. Just kidding! 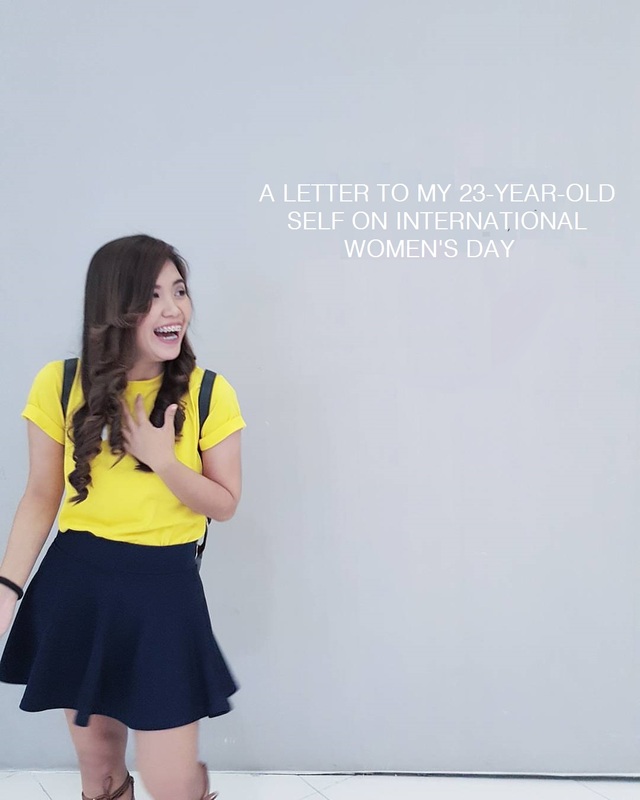 I write this letter to let you know that you deserve a message like this. You are entitled to where you are currently. You are loved since from the very beginning of your life's journey until your physical departure from Earth. I recognize all your determination and struggles. You are special and I am proud of you, girl! Please continue to amaze me. Do you remember your parents' love story? That same old, adorable and ultimate love story that your mother used to tell for nth times when you were a kid? How the gods favored their love amidst all the odds and trials? You see, you are a love baby made sacredly on that one cold evening (or day) of August 1992. You are loved bountifully and unconditionally by your parents and so are your siblings. Please remember that when you feel empty, lonely and abandoned. You have their shoulders to lean on and ears to whisper to. You are determined and passionate on what you do. Though you haven’t gotten out totally from your shell before (or even until now), “Small but Terrible” that’s what you are. From carrying 12 kilograms worth of books, notebooks and other school supplies daily in elementary days to dreadful sleepless college nights due to your #goodstudent goals of perfecting every single holy exam at school and passing the scholarship's expectations from you. From a total alien with zero knowledge anything about computer to this point wherein you manage and troubleshoot corporate computers/servers. You are a fighter and a fast learner. Those alone moments in your room that feels like forever and literally have no one to talk to. You become independent! That time when you passed the screenings of many companies and caught up confuse on what to choose. It was hard, really confusing. But then, that inner quality of you of being resilient and a little bit undecided (lol) immersed. You chose what’s near to your heart and best for you. In that way, your skills were honed. You grow as a reliable individual in almost every aspect of work that you do. Your passion for learning and pushing your limits to exceed have helped you a lot especially now. Please continue to outshine! You are a risk taker and an opportunity chaser. I will never forget that time you voted yourself to be one of the officers of your particular organization (#bagagFace). How could you do that? Luckily, the people supported your advocacy (lucky jud). I salute the courage, hahaha! That time also when you raised your hand, like Katniss Everdeen, to be one of the pioneer volunteers for one of Cebu's local technology organization (feeling celebrity). That was very challenging yet very fulfilling now! And all other events and activities you’ve been into; including those future ones (fingers-crossed). You got it girl, keep moving forward as long as you know you are enjoying the fruits of what you're doing. You need to take care of your health. Like seriously! Health is wealth. I know you are very hesitant when it comes to alcoholic drinks, that's good! But come on, you can drink some or even go to parties. Just do it moderately and don’t do what everyone else is doing, you know. You heart configuration is deadly. Please watchout! Heartbreaks are normal in your life. When you love, you have the tendency to give it all at once in the open. You bare everything. Some people whom you have offered your love, your everything will probably not need it. As a result, you will doubt yourself. You will feel useless and stupid. So the next time if you are gonna you do it, choose the deserving people. Don’t forget to reserve some love for yourself. Remember: You are worth it needless of what others say. You are a dreamer and unique specie. This particular journey that you have is totally different from others. What others are doing can bring them joy and happiness. What you are doing can also bring you joy and happiness, well with a little amount of struggles. Don’t be afraid to follow what you want. Whenever you hear others say that you got an impossible dream, nope, listen to your inner voice because it is possible! Just remember to be back on track after your life detours.